Timothy Filiga Cahill professionally known as Tim Cahill is n Australian professional footballer currently playing for Jamshedpur FC in the Indian Super League. Cahill plays as an attacking midfielder as well as a striker whenever necessary. Cahill has previously played for English club Millwall, Everton and other clubs like New York Red Bulls, Shanghai Shenhua Hangzhou Greentown and Melbourne City in different continents. he played in two different spells with Millwall, one starting and another ending his career at The Den. Cahill is the all-time leading goalscorer for Australian National Team. He has earned 107 caps between 2004 and 2018 and scored a total of 50 goals. He was the first Australian to score at different tournaments like FIFA World Cup and AFC Asian Cup. Cahill has scored in three World Cups editions ie. 2006, 2010 and 2014. Cahill is the leading goal scorer for Australia in FIFA World Cup with five goals. His aggressive and powerful approach on the field. His ability to direct the ball in the penalty area. 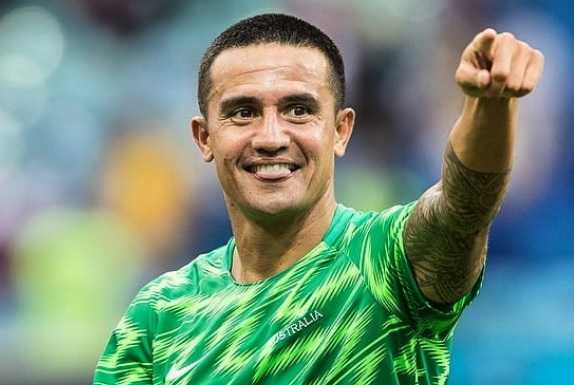 Cahill was born to an English father of Irish descent, Tim Cahill Snr and a Samoan mother, Sisifo Cahill on December 6, 1979, in Sydney, Australia. He attended Bexley North Public School, Annandale North Public School Tempe High School, and Kingsgrove North High School. Cahill grew up in a rugby league playing family. He is a brother of Samoan footballer and former Samoa Captain, Chris Cahill. Three of his cousins, Ben Roberts, Joe Stanley and Jeremy Stanley are professional rugby players. Two of his nephews, Chase Stanley and Kyle Stanley are professional rugby league players. Rugby Union professionals like Sam Stanley, Mike Stanley, Benson Stanley and Winston Stanley are all related to Cahill. During his youth days, Cahill played football for the Balmain Police Boys Club, Marrickville Football Club, Plumpton/Oakhurst Soccer Club in Australia. Cahill 's parents allowed him to travel to England to play professional football in 1997. He lived in Grays, Essex with family. Initially, he started playing football from Sydney United there. Later Millwall signed him. On May 2, 1998, Cahill made his Millwall debut against Bournemouth at The Den. Millwall lost the game by 2-1. Later, He helped Millwall reach the 1999 Football League Trophy Final. They lost the finale to Wigan Athletic. Millwall won Football League Second Division championship in 2000-01 season. Millwall made a club record of 93 points. And Cahill was part of that team. He also played two play-off semi-finals with Millwall in 2000 and 2002. He scored the winning goal against Sunderland in 2004 FA Cup semi-final and led his team to meet Manchester United in the final and secured a place in UEFA Cup. For his performance during the semi-final victory, Cahill was named FA Cup "Player of the Round". Millwall lost the final to Manchester United by 0-3, his last game for the club. Cahill scored 56 goals in total for The Lions. Cahill signed for Everton in a transfer fee of 1.5 million Pound before the start of 2004-05 season. Cahill proved himself to Everton in his first season there. He became Everton's top goalscorer. And he became fans' Player of the Season. Cahill was named as one of 50 nominees for the Ballon d'Or in October 2006. He became the only Australian and the first Everton player in 18 years to be included in Ballon d'Or nominee list. Due to injuries to his knee and foot, Cahill missed much of the 2006-07 season. Cahill took his team into their first League Cup quarter-final in more than 5 years scoring a winning goal against Luton Town in extra time on October 31, 2007. Cahill, due to injuries to his teammate strikers, played as a striker for Everton as well. Cahill scored his 100th career goal against Arsenal on January 28, 2009. Cahill was given a nickname "Tiny Tim" by Everton fans after the Charles Dickens character because he is slightly short and slim. Cahill was also named as the replacement captain of Everton in 2009-2010 season. Celebrating his goals at the corner flag became his trademark celebration. Prone to injuries, Cahill went the whole of 2011 without scoring for Everton. After playing at Everton for eight years, Cahill decided to leave Everton in 2012. Cahill signed as Designated Player for the New York Red Bulls to play Major League Soccer in July 2012. He was transferred for a fee reported to be approximately 1 million pounds. Cahill made his MLS debut against Houston Dynamo. Cahill set a new record for the fastest goal in MLS history when scored a goal in just eight seconds against Houston Dynamo on 20 October 2013. The record was later broken by Mike Grella in 2015. Cahill left New York Red Bulls on mutual agreement on February 2, 2015. Cahill signed for Chinese club Shanghai Shenhua and made his debut on March 9, 2015, against Shanghai Shenxin. Cahill's team won the game by 6-2. Shanghai Shenhua reached Chinese FA Cup Final that year but defeated by Jiangsu Sainty in extra time. Playing for Shanghai Shenhua for only a year, Cahill announced on social media on February 16, 2016, that he had terminated his contract with the club on mutual agreement. A few days later, Cahill signed with another Chinese Super League club Hangzhou Greentown. He made his debut on March 6, 2016, against Changchun Yatai and scored a penalty for his side. Just after 5 months, Cahill terminated his agreement with the club on mutual consent on July 14, 2016, and returned back to his home country, Australia. After returning back to Australia. Cahill signed a three-year contract with A-League club Melbourne City on August 11, 2016. According to the contract, Cahill would play for two years and then take coaching responsibility for the third year. Cahill made his debut for Melbourne City in FFA Cup on August 24 against Brisbane Strikers. Cahill made his A-League debut against Melbourne Victory on October 15, 2016. Cahill scored a trademark header goal in the FFA Cup Final victory over Sydney FC. The FFA Cup Final was a historical win for the Melbourne City. Cahill left Melbourne City on December 6, 2017, after not getting enough game time. Cahill returned and re-joined Millwall on January 29, 2018, under an agreement to play for the club until the end of the season. Cahill in his second debut match came on to the pitch in the 90th minute and received a standing ovation by from the stand for Millwall return. Millwall released Cahill at the end of the 2017-18 season. Cahill signed with Indian club Jamshedpur FC on September 1, 2018, to play Indian Super League. Cahill was born in Australia. Despite different birth nation, his mother was Samoan and he was invited by Samoa to play for 1994 OFC U-20 Championship at the age of 14. He made his international debut against New Zealand. Samoa lost the match by 3-0. He played a few more games for Samoa. Cahill, representing his Irish father, was also invited to play for Irish national team at 2002 FIFA World Cup. Unfortunately, he was ineligible to play for Ireland according to eligibility rules of FIFA. FIFA changed its eligibility rules in 2004, that allowed Cahill to play for England, Ireland, Samoa or Australia. Cahill chose to represent Australia, country of his birth. Cahill made his international debut for Australia in a friendly match against South Africa on March 30, 2004. Cahill then participated at the 2004 OFC Nations Cup. Cahill became second highest goalscorer in the competition with six goals. Australia won the competition for the fourth time. Australia won against Uruguay in the World Cup qualification play-off in a penalty shootout and qualified for the World Cup for the first time in over 30 years. Cahill took his team up to quarterfinal stage of the men's football tournament at 2004 Summer Olympics. Cahill was name Oceania Footballer of the Year for 2004 for his performance in the OFC Nations Cup and Summer Olympics. Cahill represented Australia at 2005 FIFA Confederations Cup. His team got eliminated from the group stage playing against Argentina, Germany, and Tunisia. Cahill scored two goals against Japan in Australia's opening group game in FIFA World Cup 2005 and became first Australian to score World Cup goal and to receive Man of the Match. Australia lost the Round of 16 fixture against Eventual World Cup winners Italy by 1-0. Cahill played a very important role when Australia qualified for 2010 and 2014, 2018 FIFA World Cup editions, qualifying for fourth consecutive times. Cahill scored twice against Ecuador in a 2014 pre-World Cup friendly and became Australia's all-time top goalscorer with 31 goals. Cahill also represented Australia at 2007, 2011 and 2015 AFC Asia Cup. Cahill took his team to 2011 Asian Cup Final. Australia lost the final to Japan 1-0 in extra time. Cahill was a part of the team when Australia won the 2015 AFC Asian Cup for the first time. Cahill announced his retirement from international football on July 16, 2018. Cahill scored a total of 168 goals in his club career playing for different clubs across the globe. And he scored 50 goals for Australia in all competitions. During his football career, Cahill received a number of individual recognition for his brilliant performances. Cahill tied a knot with his childhood sweetheart Rebekah Greenhill in 2010 in Las Vegas. The happily married couple has three sons, Kyah, Shae, Cruz and a daughter, Sienna. Cahill has a helping heart and is involved with the UNICEF children's charity. Cahill played football all across the globe. Thus, he owned homes in Sydney, Florida, New York, Shanghai and England. According to BRW, His net worth is estimated to be $28 million. Cahill was once sent off before entering the field for using "insulting, offensive, abusive language towards a match official" when he was preparing to come on as a substitute Melbourne City in a match against Melbourne Victory FC. Cahill was invited to play for the Republic of Ireland at the 2002 FIFA World Cup because he belonged to Irish descent. Cahill is only player after Cristiano Ronaldo, Rafael Marquez, Robin Van Persie, Arjen Robben, Miroslav Klose and Clint Dempsey to to score at the 2006, 2010 and 2014 FIFA World Cups.